Scrum stories can be written using the same skills you learned in elementary school. Follow the guidelines in this blog post by The 3Back Team to go from basic story writing skills to complete Scrum story. Fast forward several years and, while you might not be composing fourth-grade creative writing stories about your pet dog and his worldly adventures, you are writing Stories. Scrum Stories where the purpose of the Story is to deliver a high-level definition of a requirement. These Stories look and sound very different than those canine-inspired tales when you were 10. But are the necessary elements of writing a great Story all that different? Like the introduction of your fourth-grade story, this Story needs a Title that accurately captures the work at hand. Think of it as the text on the billboard for your project. It should be short and sweet. What’s a good Story without a little drama? The Story Description sets the stage by clearly presenting the conflict/problem to be solved. A well-written description will answer the who, what and why of the Story. Frequently, a common template is used: As a (type of user), I want (goal) so that (benefit). A good story always includes critical background information that colors the plot. In Scrum Story writing, we can think of this background information as the Epic, the motherload of Stories that is too big, complex, unknown or risky for the Team to agree to do all at once. Estimating the size of a Story is key in great Scrum Story writing. As we’ve said before, the goal of sizing Stories isn’t to establish a fool-proof prediction of the future. Rather, it is to gain clarity through collaboration and information as to what the PO wants. To this end, estimating Stories is done in units of relative effort known as Story Points. And those Story Points are the vivid details that paint the most accurate picture of the size or effort of the undertaking. Now, get up from sitting on the classroom carpet and write some great Stories. 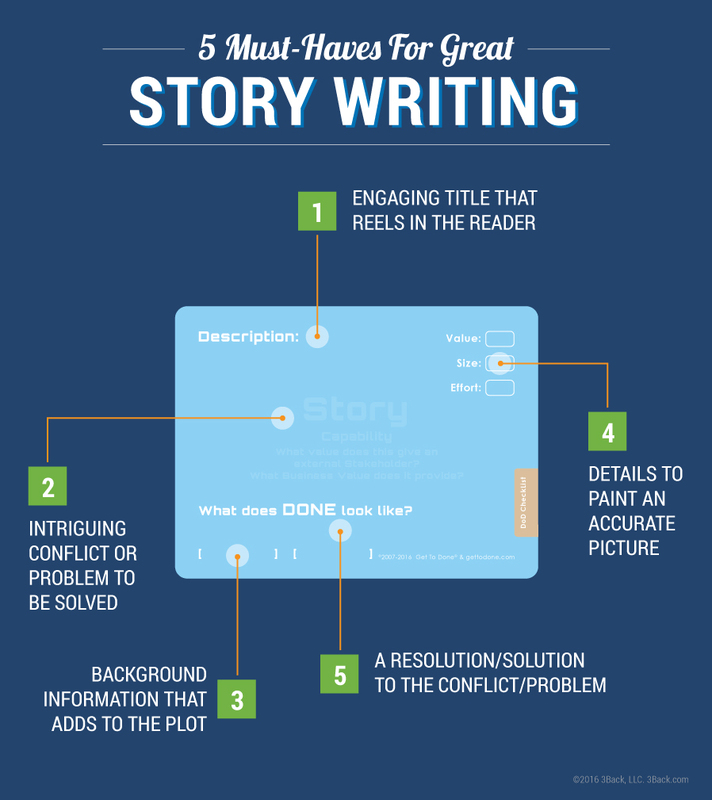 If you’re looking for additional tips on writing Stories, we’ve got more here.